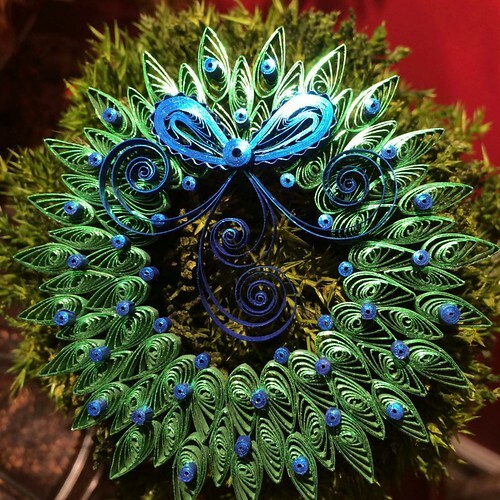 It's becoming a tradition to feature Beth Reece's beautiful quilling each December. 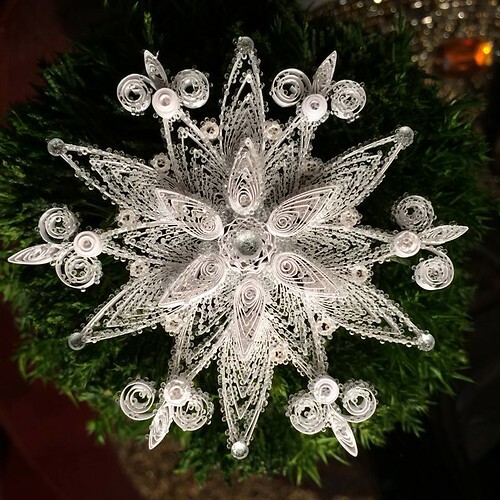 You'll find previous posts here: quilled Christmas ornaments and mandalas and here: quilled wreath, but before clicking over, enjoy these quilled tree ornaments she's been making this holiday season. 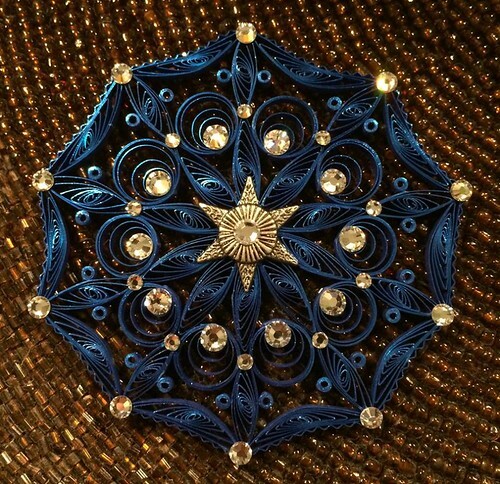 Beth uses metallic-edge quilling paper to great effect and often adds strips she runs through a paper crimper. She likes to glue on Swarovski flat back crystals as they catch the light and sparkle. Cute birds! She used the quilling beehive technique to fill in the largest one's body. 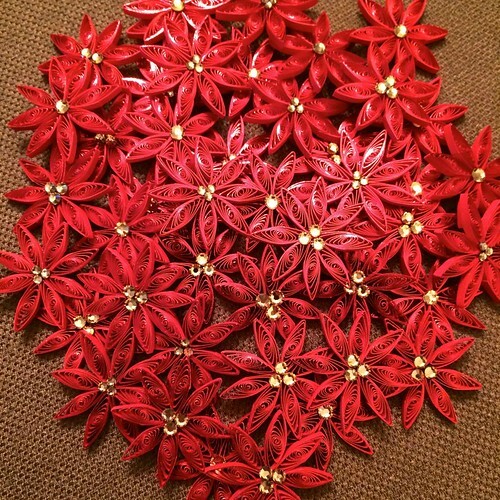 Beth even found time to make all of these little red poinsettias to hang individually. She loves to make quilled snowflakes too, as this showstopper wreath proves. I asked Beth if she would share one of her patterns and lucky for us, she agreed - thank you, Beth! This snowflake measures about 2.5 inches across - beautiful, yet not too complicated for beginners. If you're new to the art, this quilling 101 tutorial I wrote goes over basic techniques and tools. There's no need to buy quilling paper if you would like to get started right away. 1/8 inch strips cut from a sheet of printer paper will be fine for practice; use a paper cutter or a cutting mat, craft knife, and metal ruler. True quilling paper is a little thicker and softer than printer paper, and strips measure 17-25 inches in length depending on the manufacturer. 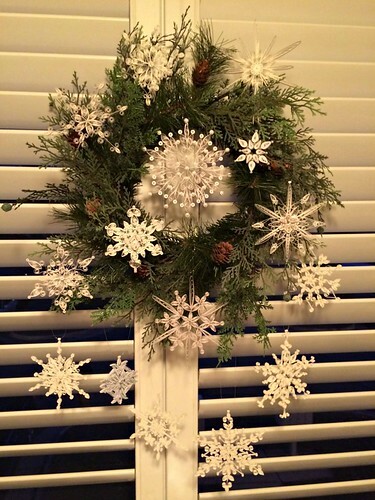 Beth likes to use Quilled Creations Bright White paper to make snowflakes as it is a bit heavier than other brands. You might want to print out a lined grid to use as a guide while assembling coils so your snowflake will be balanced. 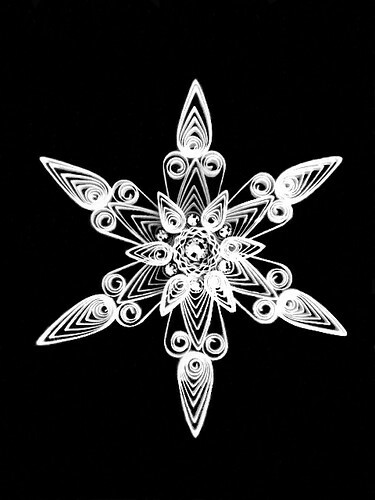 This snowflake design includes eccentric teardrops - referring to photo, they are the coils with pointed tips, and V scrolls. Work on a corkboard or circle template. Pull the center of a loose (round) coil to one side with a straight pin. Push two pins into cork, one on each side of the coil, to secure the center. (Just one pin is needed for the circle template as it has a recessed lip to push against.) Apply a tiny amount of glue to this spot. When glue has dried, remove the pins. This new shape is called an eccentric loose coil. Pinch a sharp point opposite the glued area to create an eccentric teardrop. Fold strip in half and roll ends inward toward fold. b. Glue these eccentric teardrop/V scroll combos in a circle with tips pointing outward. 4. Crimp a ten-inch strip. Roll crimped strip on quilling tool and glue end. a. Glue the 5-inch eccentric teardrops around the crimped coil with points facing outward, spacing them evenly. b. Glue this layer to the center of the bottom layer. 7. Glue a 5 mm crystal at the center of the crimped coil. Here's a pretty variation... Beth sprinkled on clear micro-beads for a frosted look. She sometimes uses silver-edged or holofoil-edged strips to make snowflakes too. To create a hanging loop for your ornament, fold a ten inch piece of fine metallic cord in half, insert the loop end through the tip of one outermost eccentric teardrop, catching a couple of the inner spirals for extra strength, bring the tails through the loop, and tie tails in a knot. You might enjoy the series of five snowflakes that Cecelia Louie has been sharing on her blog Paper Zen recently She shows some fresh design ideas and offers a grid too. Beautiful. I especially like the snowflakes and poinsettia. thanks Beth for sharing your most beautiful quilled christmas pieces!! i love the angel's colours and design....the blue wreath is unusual and eyecatching.....the snowflake are just delightful and the birds are superb!!! thanks also for the tutorial. merry christmas. These are all stunning Ann. I would have never thought of microbeads. So lovely. You're making me want to try my hand at quilling! Takes your breath away!!!! BEAUTIFUL!!! 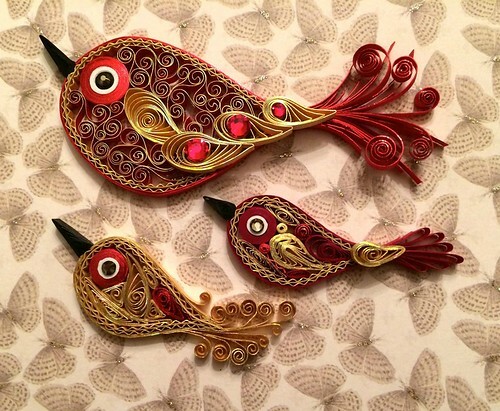 Your quilling work is absolutely stunning. I love to decorate with paper snowflakes at Christmas. Perhaps I'll try my hand at a simple quilled one. Yours are so beautiful!! Beautiful Beautiful quilling. The metal edge paper does add beauty to her elegant curls. The snowflakes are amazing. can't stop admiring Beth's gorgeous quilling. This makes me want to quill again. Now to find the time! 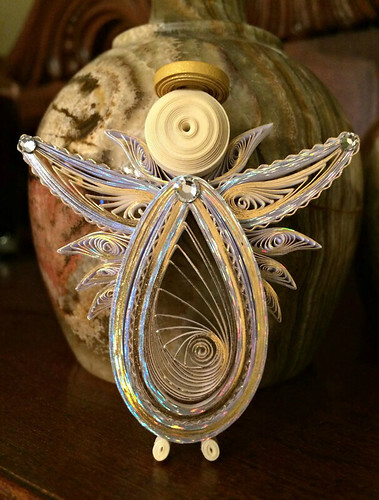 Love all Beth's quilled ornaments. Simply gorgeous!! 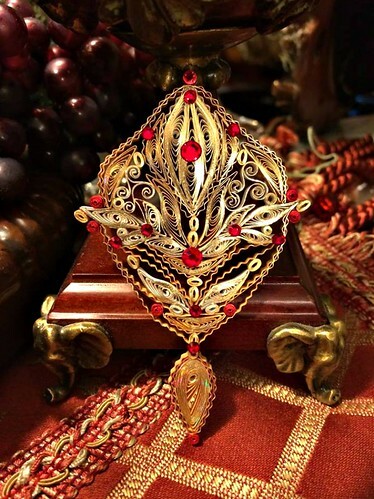 Oh my - gorgeous ornaments! Thanks for sharing them! Oh my, these are absolutely gorgeous! You are quite talented and very patient. I've tried quilling but have never had any teach me how to do it correctly. Thank you for sharing your beautiful creations, they are really quite stunning. Happy Holidays! Thanks for letting me know the link to the snowflake grid is no longer active. If you do a search for 'circle grid image', quite a few will pop up.